Showering, laundry and kitchen activities make up majority of every household's daily water usage. 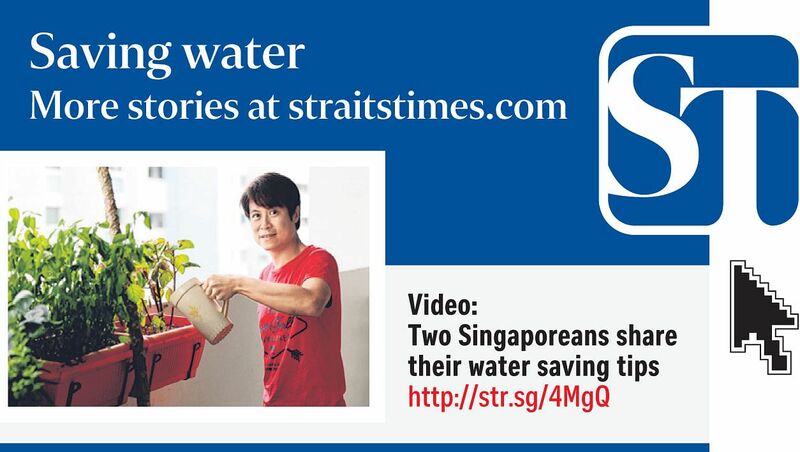 Two Singaporeans share their water saving tips. Shower with a friend, or a pet - that is the cheeky water-saving suggestion from environmentalist Tan Hang Chong. Prefer more privacy? Go with Environment and Water Resources Minister Masagos Zulkifli's tip and spend less time in the shower. Showering is the biggest water guzzler at home. Figures from national water agency PUB show that of the average 151 litres of water used by each person each day last year, almost a third (29 per cent) went down the shower drain. "I save water by using a low-flow, wide-spray setting, and not turning on the tap fully," said Mr Tan, 43, head of education and research at an environmental and outdoor education company. He estimates that his showers last about five minutes. "I've also tried standing in a bucket while showering, and using the water collected to rinse my muddy shoes and clothes after trips to intertidal or mangrove areas." Not many may share his determination to save water, although the authorities are working to change that. Last year, for instance, PUB teamed up with the National University of Singapore to examine whether providing residents with real- time information on how much water they use while showering - via a device mounted on their shower heads - would make a difference. It did. Each person shaved 5 litres off their daily water consumption. The way people here use water was again highlighted this month when Prime Minister Lee Hsien Loong announced that water levels at the Linggiu Reservoir in Johor, Singapore's main water source, had dropped to a worrying 22 per cent - the lowest reported. Water there has been depleting steadily since a prolonged dry spell in early 2014, highlighting the need for people to save water, particularly since trends suggest dry spells are likely to become more frequent. Singapore's current water usage of 1.63 billion litres a day is almost evenly split between the domestic (45 per cent) and industrial (55 per cent) sectors. There are already regulations in place to keep industries in check. Users with water consumption of at least 60,000 cubic m in the previous year must install private water meters, for one. They are also required to make an annual submission to PUB on their Water Efficiency Management Plan. When it comes to saving water, both the domestic and industrial sectors have roles to play. 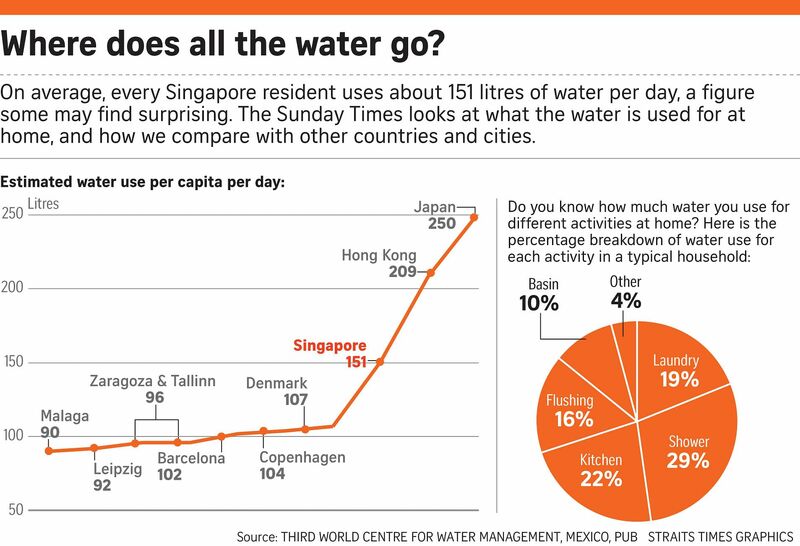 Singapore's current water usage of 430 million gallons a day (equivalent to almost 650 Olympic-sized pools), is almost evenly split between the two. There are already regulations in place forcing the industrial sector to do so. But households, which consume 45 per cent of the water, have a part to play too. Here are some suggestions to reduce water wastage at home. •Halve a 10-minute shower. This simple act could save 45 litres of water. Also save shower water by turning off the tap while soaping or shampooing. •Use a mug to brush your teeth, instead of leaving the tap running. Letting the tap run for two minutes means 12 litres of water would go down the drain. Using a mug requires just 0.5 litre. •Use water-efficient devices, including toilet bowls and washing machines. Under the PUB's Water Efficiency Labelling Scheme, water-efficient products are given more ticks. A two-tick washing machine, for instance, uses between nine and 12 litres of water to wash each kilogramme of clothes. In comparison, a three-tick washing machine can do the same for nine litres of water or less. •Wash dishes in a filled sink, instead of under a running tap. Doing so could save 28 litres of water. •Use water from washing vegetables to water the plants. As for homes, PUB hopes to reduce the amount of water used by each person to 140 litres by 2030 through various means. For instance, a labelling scheme helps consumers zoom in on water-efficient products. The more water-efficient a product is, the more ticks it has. A new four-tick rating for washing machines will be introduced next year, up from the two- and three-tick models available now. These measures could put Singapore in good stead to achieving its 2030 target, considering that a number of heavy water use activities at home involve appliances such as washing machines. Professor Ng Wun Jern, executive director of Nanyang Technological University's Nanyang Environment and Water Research Institute, said changing Singaporeans' water use habits requires education and time. Singapore has already managed to reduce the amount of water used per person per day from 158 litres a decade ago to the 151 litres last year, he pointed out. "The decline has likely been the result of education - water-saving campaigns have helped to inform and guide the public to become more conscious of the need to save, and how to save water in daily life," said Prof Ng. World-renowned water expert Asit Biswas, a distinguished visiting professor at the Lee Kuan Yew School of Public Policy, has said that Singapore may be a victim of its own success when it comes to water, as clean water is available at the turn of the tap despite depleting water supplies. He believes water prices should be increased to curb usage. Whatever the method, the hope is that more will follow the example of civil servant Ong Chun Yeow, 40, who uses just a third of the national average of water a day. His mantra is to re-use every drop of water at least once. He said: "We are still feeling the impact of the dry spell, and I see the urgency to save water instead of waiting for the day when we have to do water rationing in Singapore."